I've eventually reached that point where my skin becomes paler and my hair darker on a daily basis...ahh, winter. I seem to always be going on about layering at the moment (apologies for sounding like a broken record!) but it really is the best way to dress at this time of year, especially when you're going from the freezing outdoors to hot stuffy public transport, then out again to the cold and straight back into central heating. I'm loving these boots at the moment (they're sold out, but try Topshop for similar); I've been wearing them over jeans and with tights and dresses - perfect for rainy days! Wearing a shirt under a jumper is a great way of layering without heating up too much, and it adds a nice bit of extra detail to an outfit. 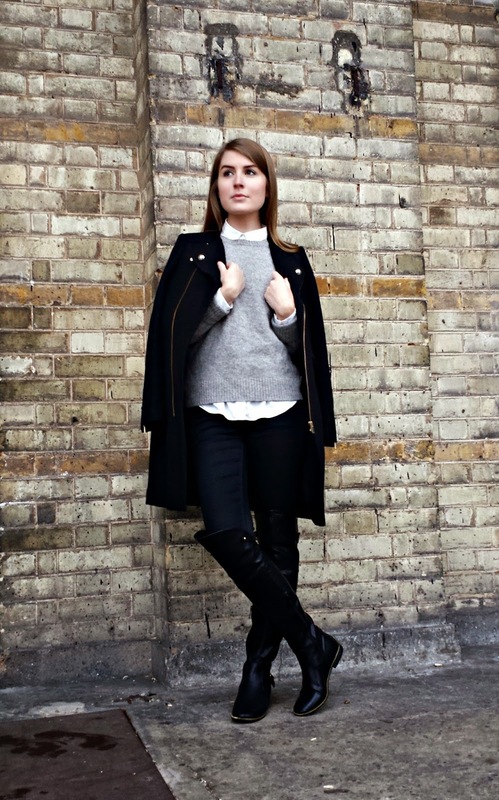 I love layering black and grey for winter - the boots look amazing!